To fulfill the assorted requirements of our clients in the best possible and trusted manner we are passionately engaged in offering a wide range of Lead Ingot Casting Machine. Lead Ingot Casting Machine is a semi-automatic machine normally used in formation of the lead ingots through a continuous operation. Molten lead is poured on the casting moulds to shape it in the form of Ingots. Water is sprinkled to keep the temperature of ingots in check. This machine is a combination of conveyor mechanism where in casting moulds fit on the chain. After completing process of refining, molten Lead normally pumps out /tap out at regulated pouring speed. The moulds are synchronized with the chain grooves and drum pour out the molted Lead accordingly. Ingots are subject to hammering at end point to release them from the moulds. 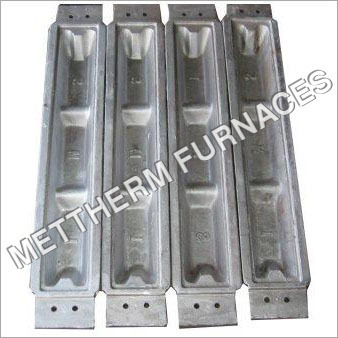 Established in 2006, Mettherm Furnaces is manufacturing and exporting a huge compilation of Battery Recycling Plant, Lead Smelting Plant, Lead Refining Plant, Lead Ingot Casting Machine and much more. Manufactured making use of supreme in class material and advanced technology; these are in conformism with the norms and guidelines defined by the market. Along with this, these are tested on a set of standards prior final delivery of the order.